There are a number of different options for church pews, ranging from completely solid wood church pew construction where the seats are unpadded and made of solid wood planks to church pews that have wood veneers on particle board. Our standard and most popular offering is padded church pews that use a combination of high quality plywood and solid wood. We also offer completely solid wood church pew and bench options. Knowing your churches needs can give you good clues about what to look for in a church pew and where you can save money. Since solid wood needs to be carefully selected to avoid knots and areas of weaker quality, building a solid wood church pew is more expensive. If your church has a large budget, solid wood seats might be an option but be mindful that it’s not always the best option. Solid wood church pews aren’t as comfortable as padded church pew seats. However, your church pews should use solid wood for church pew ends. 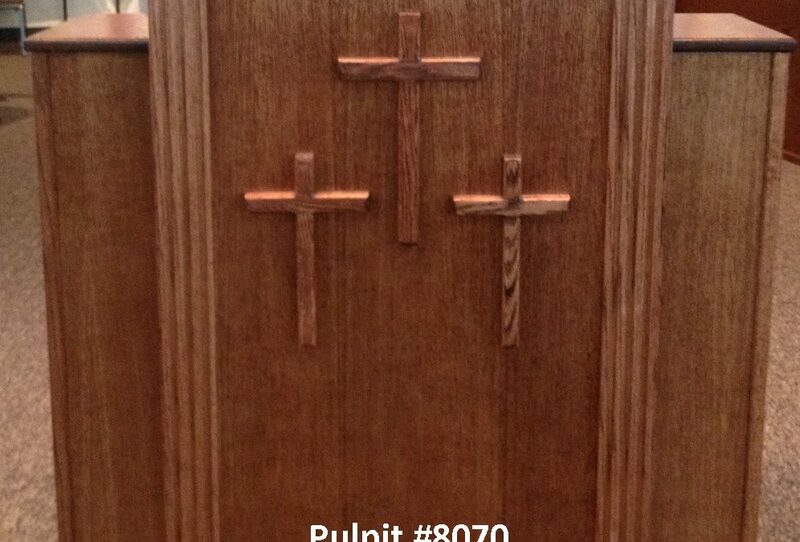 Solid wood lasts longer than veneers, allows for beautiful woodworking, and is the best choice for church pew ends. The seats for your church pews need to be able to stand up to long-term use and still to make the best use of cost effective materials. The first thing to know is the difference between plywood and particle board. Plywood is made of sheets of solid wood, adhered together for extra strength, whereas particle board is millions of wood chips glued together. Since plywood preserves the strength of wood grain and layers different grains together, it’s stronger than a single piece of solid wood. Particle board, made through the destruction of the wood grain, isn’t strong and starts to sag over time under even light loads. We only use plywood for our padded church seats because it’s the best choice for long lasting pew seats. Why put expensive solid wood where it’ll be covered up by padding? If you’re looking for cost effective church pews, look for options with padded seats made with high quality plywood and solid wood church pew ends and other decorative elements. When your church is ready to price different options, contact us for a free quote to see how much you can save with our church pews.